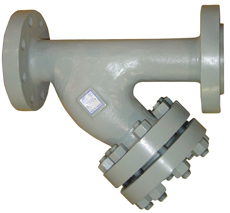 NPT Threaded Cast Iron Basket Strainer "Swivel Clamp Cover"
Sure flow Y strainers mechanically remove solids from flowing steam, gases or liquid piping systems with the use of a perforated or wire mesh straining screen, and are used to protect equipment. They get their names from their configuration, which includes a branch angled off the flow path. 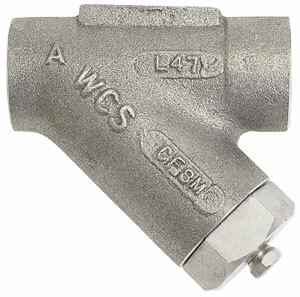 Y strainers are most often used for steam and gases, but are occasionally used for liquids. They have less debris holding capacity and higher pressure drops than basket strainers, but they can be used in either horizontal or vertical pipe runs where flow is downwards. 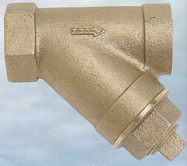 They can also be fitted with a blow-off connection at the end of the branch end that includes a valve, which allows for cleaning. 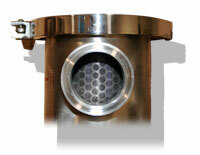 The valve is opened without shutting off the flow or disassembling the strainer, as the flow through the pipe will flush out the solids in the screen.